Green Hill's all time best selling series in now available in a gorgeous gift box package. 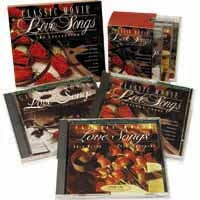 Classic Movie Love Songs, The Collection contains three full length instrumental recording featuring love songs and themes from blockbuster movies performed on solo piano by Stan Whitmire and David Hamilton. Over 30 songs total and 2 hours of music!